The perfect place to unwind and indulge. Luxury awaits you in this new development that comprises 12 independent villas with unique and contemporary design. Plots are from 965m² to 1095m², providing plenty of space surrounding your own unique villa in the sun. This exclusive, luxury development offers excellent accommodation options with the opportunity to customize to your personal taste. Choose from 3 different types and sizes, all with 4 bedrooms.. The cutting edge architecture of the project has been designed using the latest technology to ensure an ecological and low maintenance development with sophisticated detail and a high specification finish. All villas are south facing with outstanding sea views. Features include an impressive double height entrance hall, fully fitted kitchens with quality, branded appliances and separate laundry area. The terraces are accessed by sliding floor-to-ceiling doors and integrate both living spaces into one, to maximise the natural light and space. All bathrooms are en-suite and feature lavish finishes and resplendently furnished and the large open plan living room, offers distinct areas to relax and direct access to huge terracing the infinity pool and attractive split level garden. 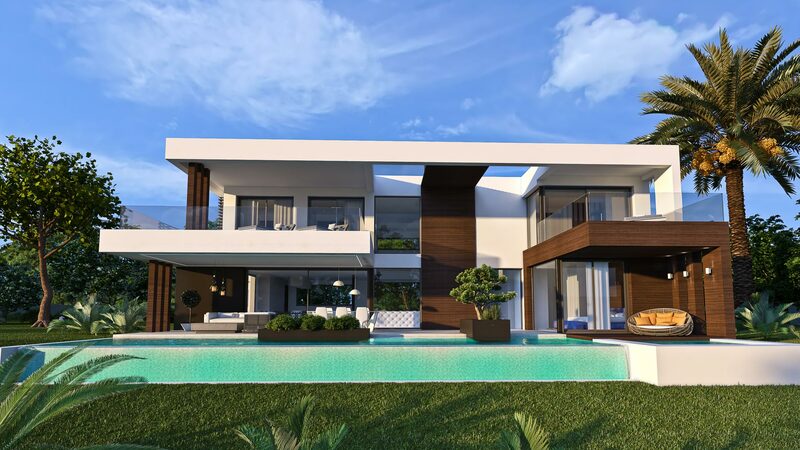 The development is located in an known as the New Golden Mile and is walking distance to the local village of Cancelada with it's shops and restaurants, whilst also being close to the beach and the nearby attractions of Marbella, San Pedro, Benahavis and Estepona.